Play Dates & Craft Shows!! I'm very happy to be sitting here typing today, not because I like blogging (though I do!!) but because I had a bit of a 'hair-raising' experience last night and nearly wasn't here to tell the tale! It all began innocently enough - as these things usually do! - when I washed my hair last night. Now, since my beloved Geek Boy had so KINDLY shared his flu bug with me, I really didn't want to go to bed with wet hair and encourage my sniffles any more than necessary. So, as I've done hundreds of times before, I reached for the hairdryer. 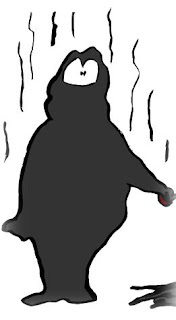 There I was, happily drying away, when my hairdryer gave a stutter, started again, stuttered, then kept going. Now, I didn't think too much of this, as it had happened a few times in the last week, instead, I just made a "Note To Self" to put a new hairdryer on the shopping list this week. Little did I know it was lulling me into a false sense of security, for all of a sudden, there was a loud bang, a flash of light and heat and a puff of smoke as my hairdryer died in spectacular fashion! And there I was, left somewhat singed and coughing from the cloud of smoke! Now, understandably, I was somewhat startled when this occurred and I screamed, dropped the frying hairdryer and jumped 6 feet backwards, executing a neat side-step to avoid collision with the loo! I then stood warily watching the malicious machine to see if it truly was dead or whether it was going to be like the monster in every horror movie and jump up to grab me when I least expected it!! That was MY perspective. In the meantime, all GB had heard was a loud 'BANG! ', me scream, a loud thump as something hit the floor, followed by silence! I think he set a new land-speed record getting from the lounge room to the bathroom, with horrible images of my lifeless body slumped on the floor driving him on. As it was, I was fine, though I have a small blister on my hand and a bald spot on my wrist where the hairs were singed off, and all GB had to do was dispose of the slain dragon so it would singe no further victims. My hero!! Tee! Hee! Hee! All in all, I realise I got off very lightly and could very well have ended up with an electric-shock induced afro! Instead, I had the interesting task of 'blow drying' my hair in front of the heater this morning for work! You see, I had just washed my hair and COULDN'T DO A THING WITH IT!!! I hate to be a cliche, but that really was the case - I looked like a cross between a dandelion and a scarecrow! So ... imagine, if you dare, a large gas heater standing about 30" (75cm) tall in the middle of the lounge room and me doubled over in front of it to dry the underside of my hair, scrunching and brushing at vent-height to try to dry and style my hair into some semblance of order! Not sure how successful it really was, but no one asked where was the tornado I'd got tossed around in, so I guess I looked passable!! SIGH!! Some days, being a girl is NOT easy!! 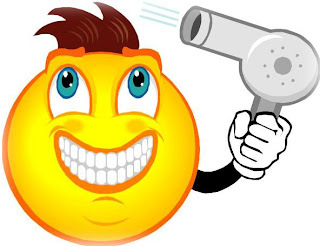 So ... as soon as GB gets home from work, we're off on the weekly grocery shopping excursion and will be making an extra stop by the electrical department to purchase a new hairdryer, which I'm sure will make me look truly glamorous!!! Alright, you can all stop sniggering now and I'll go for the more realistic goal of 'presentable'!! Hope you have an 'electrifying' evening!! Til next time, Bear Hugs! The Captain has his black, shaped hat his pirate boots, belt, flounced shirt and duster jacket, while the crewman has the lace up shirt, waist sash, headscarf and coin dangles (just like Cap'n Jack!!). You can choose your favourite or make both so you can sail the seven seas and swash your buckle in style!! I had finished the crewman some time ago, it was just the Captain version that needed to be finished and I knuckled down this weekend to do so - Kerryanne will be proud of me!! (Kerryanne is my Jimminy Cricket conscience encouraging me to be a good girl and write the instructions straight away while I can still remember what I did - she's a BIG encouragement to me!! Thanks Kerryanne!!) Now I just have to actually sit down and WRITE the instructions! GROAN!! I think I'd rather walk the plank!! Tee! Hee! Hee! 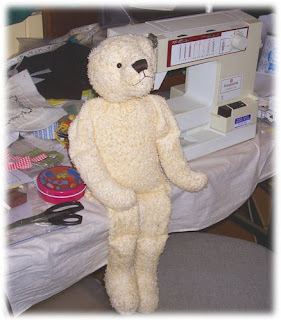 So ... now you know how my latest 'bearbie' looks when finished. Mind you, getting a photo of them standing was no easy task! I now know how Jim Hensen must have felt when people wanted to take photos of his Muppets!! Little bears are made to hug or sit and look good, not stand at attention for photo shoots! Luckily my beloved Geek Boy was on hand to lend a hand - literally! If you look REALLY closely at the photo of the two Buccaneer bears together, you'll see GB's hand holding the crewman in place. We could run a 'Where's Wally' competitions - "Where's GB?"!! Tee ! Hee! Hee! Anyways, I'm off to swash some buckles, keelhaul some landlubbers and hoist some mainsails!! Actually, I'm just popping off to put the kettle on for a cuppa, but it didn't sound very 'piratey'!! Til next time, Bear Hugs! Oh no!! A BARE BEAR! Tee! Hee! Hee! He's BEARY emBEARassed to be caught with his BARE BEAR bits showing!!! OK, I'm done with bad puns now - but BEARLY!! Tee! Hee! Hee! No, really, I'll restrain myself now! 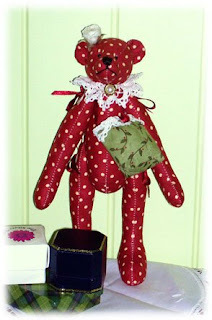 This little fellow is the bear that I've been putting off making for some time. 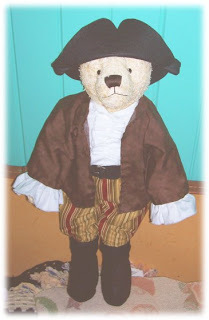 He's the second version of my Morgan the Pirate Bear that I will be teaching in Gaynah next month - you now see the urgency to finish making the prototype and write the pattern instructions!! I have actually progressed quite a bit further than this now, but will keep you in suspenders a little longer before I reveal my handsome Johnnie Depp wannabe. Stay tuned! In case you can't read the writing in the photo, Julia who commented on May 20 at 3:10am (Australian time I hope or what were you doing up so late, Julia!!) and the second winner is, Jeanne who was actually the lucky last person to leave a comment on May 24 at 2:06am (again, hope you weren't REALLY up that late!!) So, ladies, if you would like to email me with your snail mail addresses, along with your choice of Tag Along Teddies pattern, I'll pop your prizes in the mail this week. 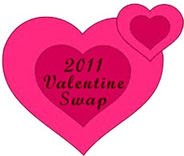 Remember, the prize was that you can choose your fave pattern from my web site, so get pickin'!! Actually, I popped over to both of these ladies' blogs and you really should pop in for a visit too - lots of fun stuff to see and read about!! Isn't it fun making new friends all over the world!! So ... that's about all I've been up to for the last couple of days, but I'll be back in a couple to show you the bare bear when he's no longer bare! It's all BEARY confusing!! On that note, I think it's time to sign off!! Hope you're all having a great weekend - I know Kerryanne has been very productive too, so check out what she's been up to! And til next time, Bear Hugs! That's right - I'm seeing red!! No, no, don't be alarmed!! I'm not the CROSS kind of seeing red! It just seems that whatever I do lately - I see red!! You've already heard about my ladybird obsession ... well, I kind of added to it today! You see, having a 'grown up' job gives me a really good excuse to buy clothes and shoes (Like I really NEEDED one!!) - after all, I need a good variety of work clothes, don't I?! So, I called upon my bestest shopping buddy, Deb, and off we went to wreak retail havoc! Ooooh! Both of our mothers would be VERY disappointed in us! Tee! Hee! Hee! 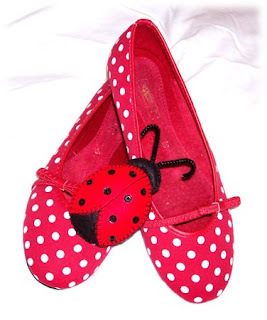 LADYBIRD SHOES!! They followed me home - really, that's what happened! Tee! Hee! Hee! Oh, the actual ladybird in this photo didn't ... more on that later!! So ... I had my ladybird shoes. On looking a little further, I found a wonderful red top that matched the shoes perfectly! So I'm now set for work on Monday!! After doing a little more retail damage at The Body Shop, Deb went to collect her girls from school and I headed home to try to be 'good' and cross something off my 'to do' list. And I did! YAY ME!! Now, we're back to that ladybird! 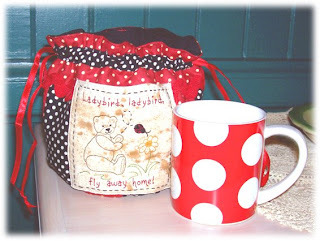 Do you remember me saying when I finished the ladybird mug bag that there was a second part to the pattern? Well, the ladybird is it! Oh, look! There's two!! 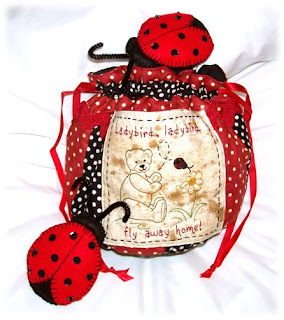 These little ladybirds are made from felt and have sequin and bead dots sewn to their backs. They can either be an extra decoration for the mug bag, a dotty brooch, or I imagine they'd look fabulous with a few friends crawling over some children's curtains. 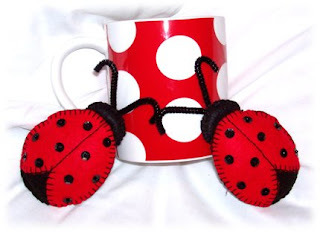 Here's a shot of them crawling around my dotty mug, to give you an idea of their size. Aren't they cute? I was pleased with how they came up. I think I'm going to sit them in a couple of my china tea cups that are displayed around the house, so that when someone goes to have a cup of tea - SURPRISE!! Tee! Hee! Hee! OH! 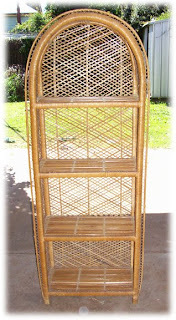 And guess what I 'spotted' in my lounge room today? 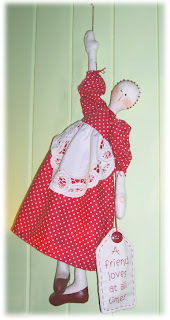 A dotty dolly! Tee! Hee! Hee! Her name is Ruby and she is one of the wonderful Rosalie Quinlan's designs. Ruby was featured in an issue of "Homespun" magazine a year or so ago and I've made about five versions of her - this one for myself, a mint green version for my Mum and a few of varying colours for friends. The original tag message was "Dear Mummy, I love you", as it was a Mothers' Day issue of the mag and I made that one for Mum, but for mine and the ones for friends, they featured this wording from one of my fave Proverbs. I'm a little embarrassed to say, that I had to photoshop out some cobwebs on Ruby, which I hadn't seen in person, but showed up in the photo! Oops! Oh well, I'm creative, you can't expect me to be tidy too!! That's MY story and I'm sticking to it! So ... now you see why I'm seeing red! Or perhaps my beloved Geek Boy was right after all and I really am going a bit ... DOTTY!!! Tee! Hee! Hee! My dancing buddy, Deb, told me a story about her youngest daughter the other day. Now her daughter is one of these kids who takes everything you say very LITERALLY!! So ... when her teacher said to her, "Next year you'll be learning another language, you'll be learning German." The little girl looked concerned and said, "I don't want to learn German, I want to keep learning English." When the teacher pointed out to her that, in Australia we already speak English, the little girl replied, "No we don't, we speak Australian!" Well ... after posting my recipe for Choc Chip Cookies, I'm feeling a bit like Deb's daughter! Who'd have thought that something as simple as a bickie recipe could get so complicated - and lead to lots of giggles about the differences in labels, terms and measurements!! So, to help clarify things a little for my overseas visitors, I went in search of some cooking measurement conversions and found this web site which is VERY handy, in fact, I shall be adding it to my favourites list for future reference! You see, I have a number of recipe books where I have to convert them from "American" into "Australian"! Tee! Hee! Hee! One recipe book, a fabulous one in a series called "Mug 'Ems", had obviously brought lots of confused feedback to the Australian distributors before, because they had added an explanatory page to the front which included the measurement conversions, as well as the 'Australian' equivalent of certain ingredients. It didn't, however, tell me how to explain to one of my new American friends what a 'sultana' is!! Hmmm, how do you explain something that you've just always accepted as part of your cooking ingredients list?!?! 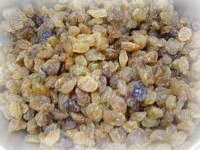 They're like a small raisin - sort of - in size, they're somewhere between a current and a raisin ... oh, here's a photo!! Hope that helps!! Whew! I dare say there are lots of other sites on the web that will give cooking conversions, this was just the clearest one I found. Any further cooking questions, send 'em on in and I'll try to answer them - I feel a bit like Jamie Oliver, without the funny accent!! Tee! Hee! Hee! 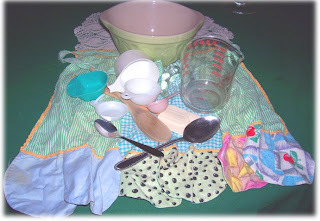 By the way, do you like the apron I've used as the backdrop for all my cooking hardware up the top of the post? It's one of those wonderful 'make do' aprons made during lean times by my beloved Geek Boy's grandmother (who is still going strong at 93!!) I've got a couple of other old aprons from my great-grandmothers displayed on my sewing room wall, because they were just too pretty to put in a drawer somewhere! Mind you, I should take a leaf out of our grandmothers'/great-grandmothers/' books and wear an apron when I cook, because I'm a bit like the cartoon Tasmanian Devil, "Taz", in the kitchen!! Flour everywhere, lids off things and my poor cook book has spill-spots all over the pages of favourite recipes. And I usually end up wiping my hands on either a tea-towel that I then have to wash, or my clothes because I'm in a hurry and can't find the cloth. Perhaps an apron would save my clothes from UCS's - Unidentified Cooking Stains!! Or maybe I'm just a grot!! At least the food always tastes good, and that's the main thing! Anyways ... 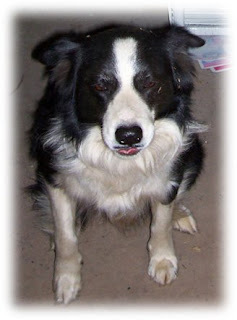 I shall sign off for now and go make myself a cuppa and munch one of my bickies, I think! Happy cooking and be sure to let me know what you think of the resulting bickies! Oooooh! And don't forget to leave a comment on Monday's post to go into my 50th post prize draw before Friday! I've been enjoying getting comments from new friends already and I know there are a lot more 'sneak peekers' out there who've not said 'g'day' before, so I hope they'll leave a comment to join the draw too. (I've seen these fringe dwellers referred to as 'lurkers' before, but that sounds a bit sinister, so I thought 'sneak peekers' was a nicer title for non-commenting visitors!!) Til next time, Bear Hugs! OK! OK! OK! I bow to public pressure and will share my Choc Chip Bickie recipe!! Tee! Hee! Hee! I shared it with Chookyblue who teased and tempted her blog visitors with a photo of her bickies, too ... and THEN sent them all to harass me for the recipe! That's OK, it's a nice sort of harassment - nice to have some new visitors and commenters on my blog! So, to keep them happy - and to quiet their rumbling tummies!! - here is the recipe! 3. Add flour, salt and vanilla and mix. 4. Add choc chips and mix through. 5. Divide mixture into small amounts and roll into balls. Place on greased biscuit tray allowing room for biscuits to expand. Flatten slightly with a fork. 6. Cook in pre-heated oven (250 degrees) until golden brown. 7. Remove from tray and cool on rack. Depending how big you make your bickies, you can get between 7 and 8 dozen out of this recipe - perfect for big (or REALLY hungry!) families, or in my case, I leave a dozen out and freeze the rest to bring out when they're needed (or craved!!). I also tend to divide the bickie dough into two, adding choc chips to half to satisfy my beloved Geek Boy's chocoholic cravings, and I add craisins to my half. They're also great with nuts or sultanas. So, happy baking and let me know how you like them!! Now, today is also a very special day for me - this is my 50th post!! WOW! 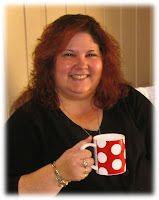 Who would've ever thought that a diary-challenged person like me could stick with blogging long enough to post 50 times! I have to say, I've thoroughly enjoyed my entry into the blogging world and have made so many new friends - all of whom are listed on my side bar and their blogs are well worth a visit - or two ... or three ... or daily! Tee! Hee! Hee! I've even had the chance to meet a few in person, which has been wonderful, and I'm looking forward to getting to know even more people in the blogosphere - I love a good chat! And how did I celebrate this momentous milestone?!?! Yep - a real WILD CHILD, I am!! Tee! Hee! Hee! I curled up in the lounge with a cup of celebratory tea, a couple of bickies and the latest "Homespun" issue, which I hadn't quite got around to reading due to a busy weekend. You can just see Elegant Ella bear in the far left, wondering what I'm up to! BUT ... the OTHER way I'm celebrating 50 posts (with many more to come!) 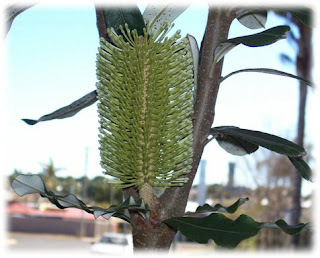 is to thank all of the wonderful people who pop in to visit my blog - especially the ones who leave lovely comments, even if it's just to say "G'day!". So ... I'm saying "THANK YOU" with a prize - everyone who leaves a comment on this post between now and Friday will go into the draw for a Tag Along Teddies pattern of their choice. Just pop across to my web site to have a look - there's something for everyone, from bears (of course!! ), to cloth dolls, to wall hangings, an advent calendar, Christmas stockings, Card Kits, pretty stitcheries and practical (but still pretty!!) bags. 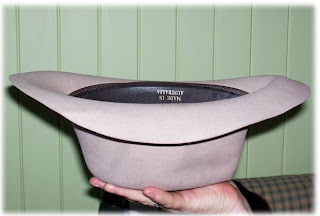 On Friday I shall find a hat to place people's names in and will get my wonderful Geek Boy to draw two out. So ... get commenting!! Tee! Hee! Hee! 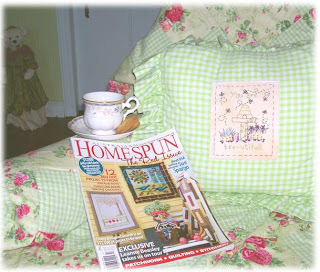 Right now, however, I'm heading back to the lounge room for another cuppa and more "Homespun" reading to celebrate!! Not to mention that on a cold, blustery day like today, curled up with a cuppa and a craft mag in front of the gas heater is DEFINITELY the best pastime to be involved in!! Til next time, happy cooking and commenting - Bear Hugs! Brrrrrr!!!! The cold front the weatherman warned us about hit Toowoomba last night! In fact, I can almost tell you the TIME it hit, as we were at a 21st party, sitting in a marquee and after a brief rain shower, the wind changed and I'm pretty sure it was blowing up from the antarctic!! It whistled under the sides of the marquee and up my skirt - how RUDE!! And today has just been plain NASTY!! The temperature didn't climb above 15 degrees and the westerly winds were roaring through at about 40km/h. So what did I do? I stayed INSIDE!!! I'm not as silly as I look! OK, that's where you all jump in and insist that I don't look at all silly ... SIGH!! It's hard to get good help!!! I love the burgundy against the teal and the white keeps it from being too dark without taking away from the rich colours. You should have seen me trying to get the two sides even, though!! Who needs an aerobic workout or a 'step' class! 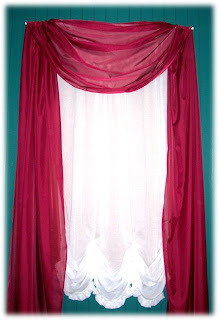 Just hang some draped curtains! I would go up one side of the ladder and fix that side, then down the ladder, then up the other side and fix that side, back down the ladder - stand back, have a look, mutter that the sides were uneven and start the process all over again!! If the truth be known, I think it's still uneven, but my poor dodgy knee wasn't going to make it up and down the ladder for the 78th time!!! On the up side, for the half hour I was up and down the ladder, I was warm!! Tee! Hee! Hee! In the words of a famous blue Muppet monster ... "COOKIES!!!!" Tee! Hee! Hee! Actually, we usually refer to them as 'bickies' in our house and these are my world-famous ... Australia-famous ... OK, famous in my immediate circle of friends ... choc-chip bickies and they are YUMMY!! I've passed the recipe on to Chookyblue to try and she dropped an email today to tell me she was baking too, so we'll see what her verdict is!! I actually split my batch into two - half with choc chips for the chocoholic Geek Boy and half with craisins for me. What could be better on a nasty cold day than a cup of hot chocolate and some freshly baked bickies - apart from a sudden heat wave, of course! Tee Hee! Hee! So ... that was my day today. I was actually pretty pleased to cross several things off my 'to do' list this weekend, including the bickies and curtains, so hopefully the rest of the week will be as productive - it's always good to start with high goals for the week ahead! Tee! Hee! Hee! Right now, however, I'm off to find some bed socks and a hot pack to warm up my cold tootsies. Hope you're cosy and warm whatever you're up to tonight! Til next time, Bear Hugs! OK!! Who stole my week?!?! I seem to have misplaced four days! I remember posting here on Monday - and then suddenly it's Friday and I'm pretty sure someone stole four days in between! Tee! Hee! Hee! Whew!! What a BUSY week I've had! I'm sure if I tell you about it, you'll excuse me for not posting more often this week - but perhaps you'd better get a cuppa first, cos this could be EPIC! Tee! Hee! Hee! So ... I started my 'grown up' job on Monday - I am now working Monday to Thursday mornings as an Administrative Assistant/Receptionist for a retirement village at Highfields - which is VERY handy ... but more about that later!! 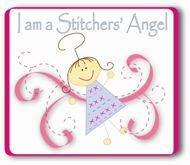 Even though it means I'll have a little less designing and sewing time, I'm really excited about my 'grown up' job, because already, I'm meeting lots of interesting people with lots of great stories to tell - yep I'm a big kid at heart when it comes to listening to stories!! Oh, a few people have asked why I keep referring to it as a 'grown up' job. It's just because I have to be a 'responsible grown up' and get up and be at work on time and work formal hours, as opposed to my 'fun job' of designing from home, where my hours and work schedule are fluid and flexible. Now, where was I? Oh, I remember!! My new job is at Highfields, which, very conveniently, is also the home of Quilters Angel - one of my fave patchwork shops!! And this worked out even BETTER (as if that could be possible!!) because it's also where my friend Miss Mary and the girls from the Fresh Hope program have their monthly sewing day. So, after finishing work on Wednesday, I joined them for an afternoon of stitching. And, wouldn't you know it?! Some fabric followed me home! At least that's the story I told my beloved Geek Boy, so it's the one I'm sticking with!! Tee! Hee! Hee! Ta da!! 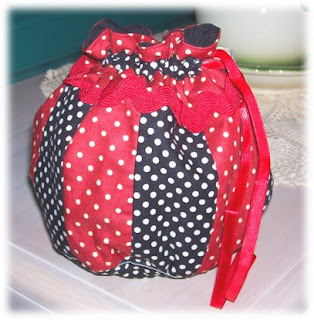 A mug bag to match my new dotty coffee mugs!! Very handy to carry your fave mug - or tea cup for the more refined of us! 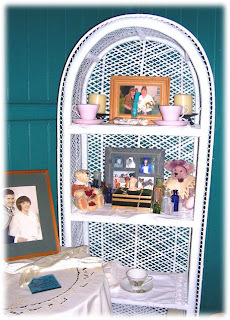 - to sewing groups or patchwork classes, or like I intend to, store your work mug so it doesn't get dirt or bugs in it! 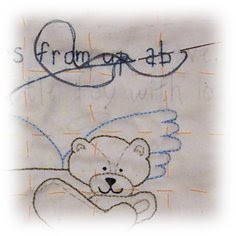 The stitchery forms a pocket that is just right to pop in a few teabags, gourmet coffee sachets or even a teaspoon and while you'd already met the ladybird, you hadn't yet been introduced to Bert the bear! There is a second part to this pattern before I have to get down to writing instructions, but I thought I'd show you what I'd been up to. Here it the back view - it's a little hard to get the overall look of it in one photo. 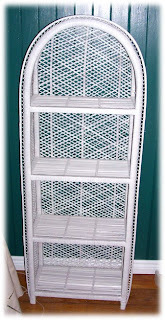 I used some of the jumbo rick-rack I bought at Stitches and Craft to dress it up a little and am pretty chuffed with the overall results. 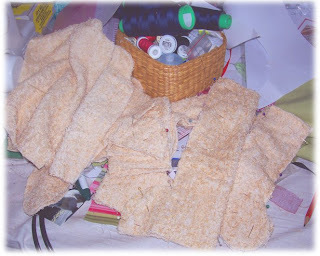 Now I just have to find the time to finish the second part of this pattern ... and then write instructions - GROAN!! 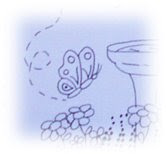 This is part of the sketch I emailed to Lisa - well you can't expect me to reveal EVERYTHING!! Tee! Hee! Hee! I explained to Lisa that I'm a bit pressed for time at the moment with a few deadlines starting to loom, but she assures me she has a friend who will stitch up the prototype, so keep an eye out for it on Lisa's site. So ... that's what I got up to this week ... THEN ... I had my dancing buddies, Deb and Lynda over for lunch and cuppas and catch up today, which was fabulous! Deb and I have been able to catch up a little, but Lynda's part time work (she's not sure if it's a grown up job, because it's Kindergym and she says she has too much fun for it to be grown up work!!) has kept the three of us from getting together for our regular weekly cuppa and chat sessions, so it was great to have the trio together today. And Lynda said she didn't really feel too left out, because she knew what I'd been up to - she's been reading my blog! Tee! Hee! Hee! We did decide 'in person' is more fun, but the blog is a good stop-gap measure!! So ... THAT has been my week!! Am I excused for being a bit slack with my posting?!? Too bad!! Tee! Hee! Hee! Oooohh! Before I forget!! If you haven't already, you REALLY SHOULD check out Rosalie Quinlan's blog to meet her latest creation for the Melly and Me label she creates under with her sister, Melly. His name is Dudley and he is GORGEOUS!! He made me laugh out loud at his fabulous colours and slightly bewildered expression. You see, Dudley is a DODO!! No, no, no - I'm not being cruel!! Rosalie's latest character is a stuffed dodo and I think the pattern will have to go on my wish list!! He is too, TOO cute!! 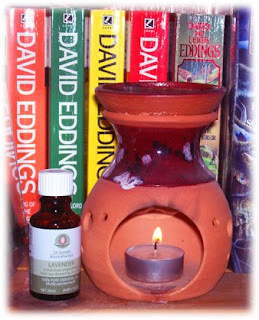 And you'll enjoy a fun read on Rosalie's blog, too!! OK, that's really it for this post! You've probably finished your cuppa and moved on to munch on bickies (wonder if Chookyblue has had a chance to make the choc chip bickies I gave her the recipe for yet?!?!) so ... I shall sign off for now. Hopefully it won't be quite so long between posts next time. Oops! I think that means I need to get busy stitching so I have something to share with you all!! Til then, I hope you have a relaxing or productive weekend - whichever you're most in need of! Hmmm ... wonder if I can manage to do both!! Bear Hugs! Can't give away too many clues yet, as I'm not finished the prototype!! AND, as if I needed ANOTHER example to make my point ... 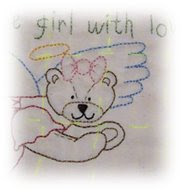 I've got a quilt design in the rough-draft stage that features ... wait for it ... ladybirds!!! (among other things!) When I pointed out these things to my ever-practical Geek Boy, he just casually shook his head and said, "It's nothing to worry about. You're just a bit dotty!!" Hmmm ... remind me why I keep him!?!?! Just kidding! Good tech support is hard to come by, THAT'S why I keep him! And he's cute ... I'll stop now before he turns as red as a ... LADYBIRD!!! AAAAAAARRRRRGGGHHHH!!!! Ooooooooh! 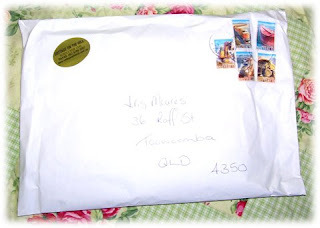 A parcel from Kerry at Cottage On The Hill! It's all Chookyblue's fault! Tee! Hee! Hee! You see, I saw a photo of some fabrics (that were JUST the right blue and green for the aforementioned rough-draft quilt!) 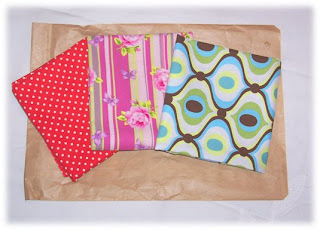 on Chookyblue's blog that she said she'd bought from Kerry when she was playing at her shop for a recent quilting day. So ... 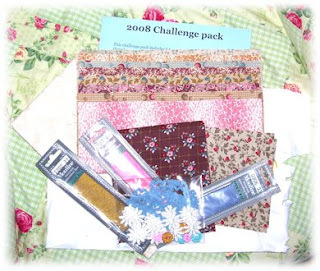 I rang Kerry and had a chat, ordered some of the fabrics Chookyblue had featured ... and a couple of others ... and the Challenge Kit! Oh dear! There goes the play money for the next few weeks! Tee! Hee! Hee! 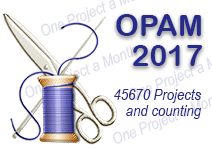 This will be my first ever patchwork/quilting challenge - I have to qualify that with the 'patchwork/quilting' has I've been challenged in plenty of OTHER areas of my life!!! Want to see my pretties?? These are the blues and greens - and a couple of others! 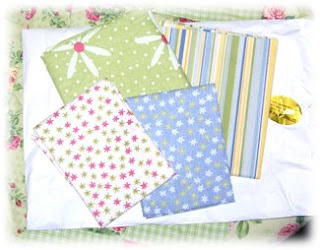 - that will join my stash towards the new quilt design. And here's the challenge pack. The cut off date has been extended to the end of September, so I SHOULD have time to get it done - if I manage to organise myself!!! I already have a couple of ideas, but nothing definite yet! Will keep you posted. 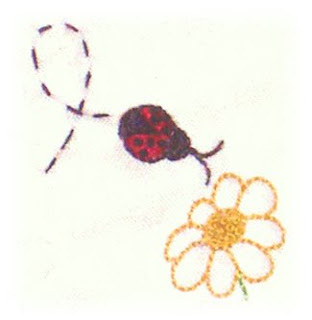 So ... all in all, what with a ladybird obsession, fun mail and starting a grown up job ... it's been a full and busy day! 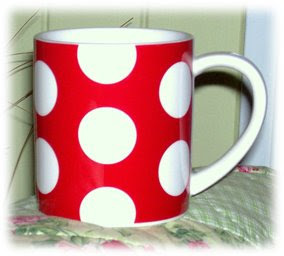 In fact, I think I feel the need for a sit down and a cup of tea - out of my matching dotty cup!! (Buy one get another half-price deal!! Tee! Hee! Hee!) I really WILL be seeing spots! Til next time, Bear Hugs! About this time last week, I shared that my beloved Geek Boy and I were painting our bedroom and while most of this was accomplished last weekend (amidst a few dramas!! Check out the Painting Dramas post!) there were all of the little fiddly bits left to take care of. The window still needs to be painted, but GB tells me he'll tackle that tomorrow. Then there was the process of moving all the nick-knacks back into the room - all of those little touches that make it 'yours'. I think this process actually takes almost as long as painting it!! 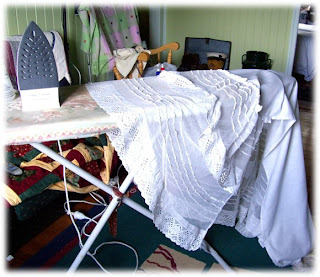 So ... the first task was to iron all of the vintage linens that had their spring clean during this process - GROAN!! I HATE ironing! 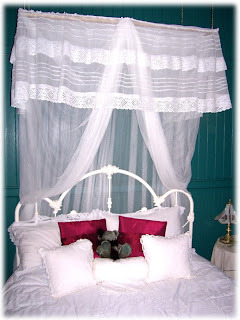 And of course, I have a passion for vintage COTTON linens, so you can imagine how much FUN this job was!! NOT!! I was really pleased with how it all looks - new doona cover in place, cozy cushions piled up with a flapper bear called Lola, reclining decadently amongst them! The only problem I found was in taking the photos! The very contrast between light and dark that attracted me to this colour scheme, makes it REALLY hard to get good photos. Either the white flashes or washes out, or the green is too dark, so hopefully these will give you a little bit of an idea of how it all looks. Here's another shot, a bit of a close up of lounging Lola! And some more linens were pressed and put back on my dressing table. The mirror caught the flash a bit, but you can see the green walls a bit better in this photo. I love the painting above the dressing table! 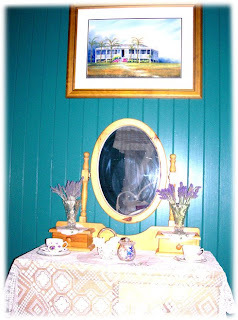 It was painted by a very talented artist from my hometown of Mundubbera, Sue Ledderhose, and the house is actually a wonderful old house in the main street of the next town over, Gayndah. Growing up in a small town, our nearest big shopping destination was Bundaberg and we had to drive through Gayndah to get there. Each time we went through town, I would drool over the lovely old house, so it's great to have a painting of it, particularly since the artist is a friend!! And it looks great on the dark coloured walls!! While GB was working out the best way to hang the bed canopy, I decided to give my cane hutch a bit of a shabby make-over to match the new look room. Here is the before photo. I just love the white against the dark green!! Happy dance!! Tee! Hee! Hee! Thanks to everyone who has left encouraging comments about my colour choice - it's nice to have others validate my decision and I love seeing how people decorate their homes, so thought other people might enjoy a peek at our room make over!! Glad they have! I have another photo to show you, too, which was one of those 'happy accident' shots! Before I brought the hutch back into our bedroom, I decided to take a photo in the same spot as the 'before' photo was taken for continuity. Well, Wombat decided he'd like to be a media star, so plopped himself in front of the hutch. When I was previewing my photos to decide which ones worked best, I decided I preferred the hutch photo in front of the dark green wall, but I discovered something funny in one of the outside shots! When I zoomed in a bit, look what I had captured! Can you see?? Wombat looks like he's closed his eyes, stuck out his tongue and said "NYAHHHHHHH!!" Tee! Hee! Hee! Not at all a dignified look, but gave me and GB a good giggle!! So ... that's how our painting has progressed so far. Once GB finishes the window trim tomorrow, it will be up to me to make new curtains to cover the timber blind we've put up to block out the neighbours' annoying outside light that they leave on, shining right into our bedroom window!! It's great for shadow puppetry, but not so good if you want to sleep! The blind was self-defence!! And it will be covered by curtains ... I'll share once it's all done - promise!! For now, however, I think I'm off to try to get white paint out from under my nails - how on EARTH did I manage to get it there when I was using a SPRAY PAINT and didn't even TOUCH the paint or the hutch while the paint was wet!! Yet another of life's little mysteries!! Til next time, Bear Hugs! No, no, no!! I haven't been inhaling strange substances to make me hallucinate or forgotten to drink enough water today so I'm having dehydration dreams - well, OK, maybe that second one cos I've been busy! 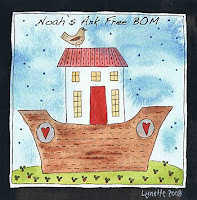 The Rainbow Cows from the title are the subjects of the latest BOM block from Lynette Anderson's "Noah's Ark" free BOM. 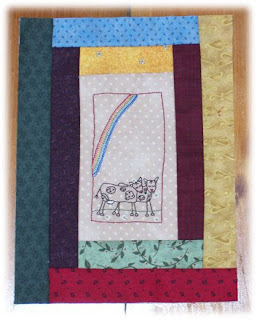 And, actually, they're not 'rainbow coloured cows', really, the block features COWS in a pasture with a RAINBOW overhead ... maybe it's just easier to show you my finished block! Now do you see what I was trying to explain?!? And can you guess the cow's name? (Because we all know only ONE of these can be a COW, as such, because Noah took COUPLES of each animal and we ALL know there are no MALE cows - they're BULLS!!) 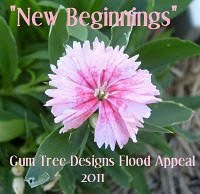 It's 'Blossom', of course! You just have to look at the pretty flower behind her ear for the clue!! Tee! Hee! Hee! Oh, yeah! Lack of sleep starting to tell here tonight!! I love how the rainbow came up in this block, though was annoyed at myself that the border ended up a little crooked - looks like the farmer went on a bit of a bender before he built the cow paddock fence! Tee! Hee! Hee! 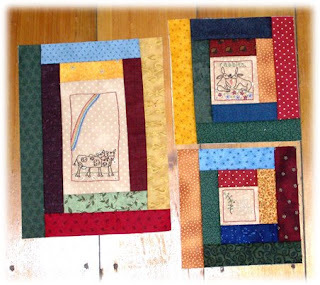 Not only is Lynette offering this fun and funky pattern to all in blogland for FREE, she's introducing us to talented stitchers all around the world by giving us links to blogs featuring finished blocks - I've met some fun new friends!! The most recent of these being Granny Loz in South Australia. Make sure you take a peek at her cows under a rainbow - there, I found a more accurate way to describe the block this time so there was NO confusion about psychedelic bovines!! Tee! Hee! Hee! 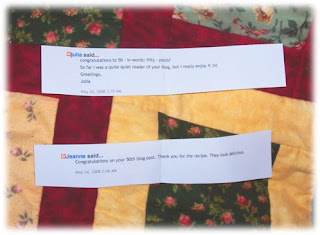 So, thanks again for the great BOM, Lynette, and for introducing us to new blogging friends! Well, as you can tell from the muddle-headed-wombat ramblings tonight, I'm a little weary and in fact, I think my brains have dribbled out my ears tonight, so I think it's time to go visit my pillow! Oh! Thanks for all your encouragement and confirmation of my colour choice for our "Let's paint the bedroom" project - much appreciated!! The main painting of the bedroom is finished (walls, ceiling, door, skirting boards), just some trim to finish around the window, so I'll keep you all in suspense a little longer until I have the "After" photos taken at the very end!! Til next time, Bear Hugs! Those of you who pop in for a visit frequently will know that I've been trying to convince my beloved Geek Boy for some time to paint our bedroom. Well ... with his RDO on Friday and the May Day holiday on Monday combining to give us a four day weekend (and the budget looking so sickly that we couldn't really afford to go away!!) I finally got my wish! YAY! I've got a new doona cover that I've had tucked away for months now, waiting until the painting was done and have had make-shift curtains up ... until the painting gets done ... can you see the pattern here?!?! So, I was very excited to FINALLY be painting. Off we went to get the paint - not even an argument this time!! You see, I'm a colour freak who's married to a colour conservative! So, usually, there are lengthy discussions along the lines of "You can't have a colour that BRIGHT in there!" and "That colour is so dull it will send me to sleep!" We usually find a compromise that, I have to give GB credit, is usually closer to my pick than his, but this time I just showed him what I wanted and he said "OK". WOW! Then it was home to clear out the smaller pieces of furniture and cover the bed so we didn't find any abstract paintings on our sheets. No, I haven't been secretly turned into a 'pink' person - the sheets were a wedding present and too high a quality to not use. 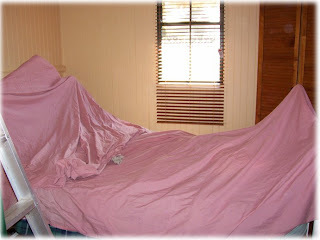 Besides, they were either covered with the doona or it was dark, so I couldn't be offended by the pink!! Tee! Hee! Hee! Apologies to all those pink-lovers out there - it's just one of my least fave colours!! So, then we hit the paintbrushes. Want a sneak peek? Here's Geek Boy in action - see? Not just a computer geek!! What do you think of my colour choice?! It's called "Emerald City", but it's actually more of a dark teal. 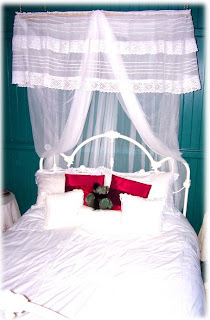 It will have the winter white trims that all of our house will eventually have and the bed is winter white iron, the new doona cover is white with Battenburg lace inserts, the mozzie net and half tester valance are white ... I saw a dream bedroom done this way in a magazine years and years ago and have been working towards it ever since!! It reminds me of the ocean - the deep teal of the water with the white foam - very peaceful and serene - at least to me! And Geek Boy actually doesn't care too much, especially when I pointed out his good fortune in not being married to someone who wanted the bedroom all pink and frilly and lacy!! Tee! Hee! Hee! Now, things were going swimmingly today on day two of our bedroom make-over when GB's paint bucket made a wild bid for freedom - from the top of the ladder! I was outside painting skirting boards at the time and only heard the loud crash and resulting loud muttering about the parentage of said paint bucket!!! On cautious inspection (didn't want the same verbal haranguing the bucket got!!) I peeked around the door to see a fairly sizable puddle of paint on the floor and GB frantically trying to get as much back into the offending bucket as possible. After much huffing, several buckets of water and lots of dark teal rags, the mess was attended to, but GB decided lunch and a little kindy kip might be in order before he went into battle again. It was a birthday gift the first year we were in this house when I was trying to get some gardens happening on a shoestring budget. My sister-in-law and her hubby gave me five plants from a market stall and all the label on this one said was "Pink Wisteria". Well, it doesn't behave or look at all like the traditional purple wisteria that is a perennial vine, but it is very pretty and the flowers are so delicate looking. It's a bit of a 'surprise' plant, in that, it sends up random runners that pop up in some very unlikely places in the garden, flower, then die down and disappear, only to reappear somewhere else next spring. My garden is as unpredictable as I am! Tee! Hee! Hee! Anyways, I think Geek Boy's nap allocation is almost gone, so I'd best go crack the whip to get him moving again - hopefully without any more catastrophes! I'll keep you posted on progress! Til next time, Bear Hugs! Well, here I am, back from the Stitches and Craft Show in Brisbane! HAPPY SIGH!!! Lynette and I had a WONDERFUL play date exploring the Craft Show, though it did seem a little smaller this year, an opinion shared by my blogging buddies, Linda from Lilly Cottage and Linda from Many Things To Do. (I seem to be accumulating a collection of friends called "Linda" - what a nice collection to have!! Tee! Hee! Hee!) Still, there were plenty of goodies to catch our eye - and spend our play money on! Tee! Hee! Hee! We arrived at the Show at about 11am and decided we both needed a caffeine fix, so made our way to the food court. Hmmm ... short lines, fresh food just being put out ... an early lunch was voted on to build up our energy! Thus fortified, we ventured forth!! 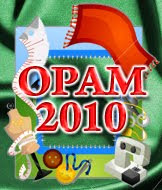 There were cross stitch patterns, scrapbooking supplies, beads, beads and more beads! 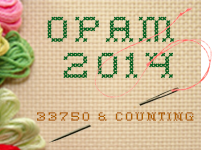 !, buttons, wools, threads, bears, dolls, quilts, and ... FABRIC!! Mmmmmmm!!! Fabric!!! I've decided I have a serious addiction going on here!! Particularly when I got home and discovered that, apart from some relatively boring perle thread for bear noses (haven't been able to get the nice dark brown in a ball at Spotlight for ages! ), and a new keyring (photo in a minute! ), the only other thing I bought was FABRIC!!! Oops! In my defence, it was all for a new quilt design I'm working on ... Aaaaahhhhh! Who needs a defence, I just like fabric!!! Tee! Hee! Hee! Would you like to see what I bought at the Craft Show? OK! Tee! Hee! Hee! Tricked you! 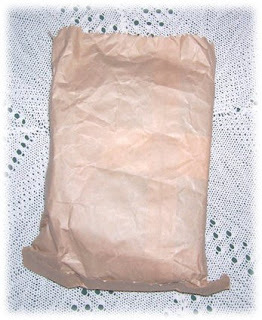 Actually, I was just a little depressed to find that all of my buys fitted into one small brown paper bag! Sigh! The play money really doesn't go as far as it used to. Although, in craft, it isn't really size that matters - it's quantity and quality!!! OK, so ... here is the keyring I found. Isn't it pretty!! It's not very big, but that's what I was looking for. I've needed a new one for some time after the tassel on my old one disintegrated - it wasn't pretty!! Tee! Hee! Hee! Plus, I knew the bell tinkling would drive Scott nuts - oops! Did I say that out loud!!! Aren't they cool!! 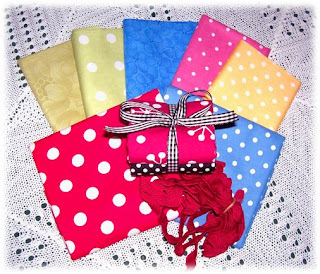 A little bright, but the quilt I have in the design process is going to be a nice bright one that will be great for a child's room - or my sewing room, which is where mine will live, as the colours match the fabric I've used for fabric panels in my shabbily chic restored cupboard! Can you guess what these fabrics will come together to create? You'll have to wait a while for this quilt, though, as I have a bear pattern to finish first or I'll be forced to walk the plank - that's a clue about the bear pattern I've got to finish!! Oh, you might notice there's some yummy jumbo rick-rack there, too, also to be incorporated into the quilt - I think!!! By the time I'd accumulated all my goodies (and Lynette had a few in her bag by this stage as well! ), we decided it was time for a little sit down, a cup of coffee and a sweet treat to replenish our energy supplies. We got a very kind lady at the next table to take our photo. Ooooh! Look! Lynette SHRANK!!! Tee! Hee! Hee! No, actually the bench seat was heaps lower than the other chairs - which I discovered when I was the one to sit on it for our early lunch - and all but disappeared under the table!!! After a lifetime of Lynette towering over me, it was nice to briefly be the same height!! And the coffee was pretty good, too!!! We then had a last quick look around - to make sure we hadn't missed anything!! and headed off to collect Lynette's offspring from school. Aaaaahhhh!! A successful play date!! Actually, I also got to catch up with a great mate at the show - but didn't get a photo, sorry! 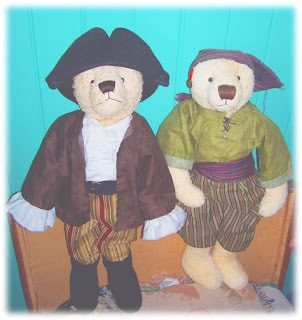 Jacqui Rose of Bears On The Wharf at Mooloolaba was the person to first encourage me to take the plunge and start designing my own mohair bears. She was incredibly supportive while I was learning and gave me lots of tips, good advice - and helped me adopt more than a few bears! Tee! Hee! Hee! 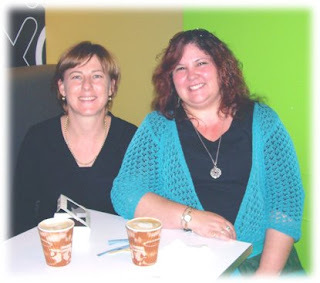 These days, we seem to only catch up at Craft Shows, or if I'm lucky enough to get away to the Sunshine Coast for a week's holiday, so it was great to catch up on her news. So ... there you have it, a round up of my play date with Lynette at the Stitches and Craft Fair! Stay tuned for the continuing adventures!! Tee! Hee! Hee! For now, however, I think I'm off to have breakfast! I know, it seems late to be breakfasting, but I woke up a little earlier than usual - with some assistance from a horrible dog next door barking!!!! - and decided to jump on the computer to pop this post on before I got side-tracked by daily life. My beloved Geek Boy as a four-day weekend, thanks to an RDO today and Monday's May Day holiday, so I'm hoping - fingers crossed! 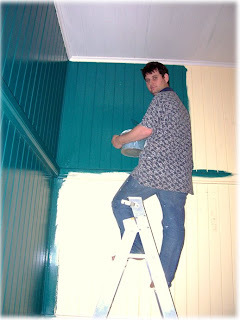 - that I can talk him into doing some painting - will keep you informed!! For now, I'm off to find a nice bowl of Uncle Toby's porridge (with apple and sultanas of course!!) to warm up my tummy, as it's once again pretty cold here. I'm REALLY NOT looking forward to winter!! Til next time, Bear Hugs!